Besides potting soil and composted manure is there anything I need in the container ? Potting soil seems too loose so maybe some mix it with some Oklahoma red dirt ? I find all the potting soils to loose and they dry out to quickly. I mix it with sandy loam and it eventually makes some nice dirt. I used to be able to get what was called mushroom dirt. The stuff commercial mushrooms were grown in. Made some really good garden soil when mixed in with our heavy dirt. I’d suggest not putting the weep holes in the bottom. Put them in the side to leave about an inch reservoir of water. Water with pond water/well water/spring water. Huge improvement over tap. Cross-7 wrote: Last year I didn't have good luck growing tomatoes so I'm thinking about trying to grow them in empty lick tubs. Mix 1 tablespoon of Epson salt in the soil around each plant. Mix 2 tablespoons of Epsom salt in 1 gallon of water when watering your plants. Generally, you’ll know if your tomato plants are suffering from a magnesium deficiency if you see the tomato leaves turning yellow. Do not wait for this to happen! Drenching with Epsom salt improves the overall health of tomato plants by giving them a good dose of magnesium. Every since I started doing this with every tomato plant, I have had good luck. I have not had very good luck with pepper plants and I think this year I will start using the Epsom salt with them. Might work ok for tomato tho. I'll see if I can find some good soil to mix in. I grew potatoes in a couple of the tubs last year so they already have holes in the bottom but the others I can drill in the side. The tubs are approx 2-2-1/2 ft deep/tall. How much soil do they need. Fill it full or will half full be enough ? Maybe Dun will chime in here...he suggests adding ??? to grow really good container tomato. Tomatoes will always do better grown in the ground. I grow them both ways every year. Cross-7 wrote: The tubs are approx 2-2-1/2 ft deep/tall. I’d fill em up. The more soil the more it will resemble being in the ground. 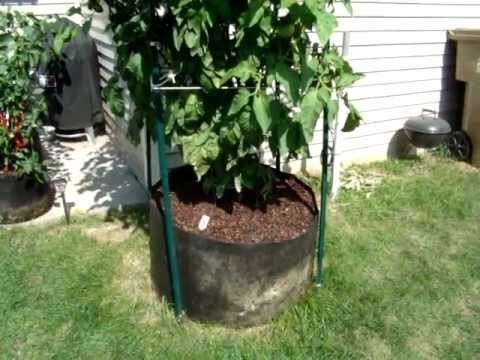 Being above ground and in a black container is going to heat and dry the soil. Those cracked rubbermade water troughs work good also. If you are going to do the container thing you should try planting some indeterminate tomatoes as well. When done right, these will continue to bear into the fall. Had a neighbor who did it in containers and his were nearly sixteen feet tall before the frost finally got them. I tried it but it didn't work for me. Me and tomatoes don't seem to get along.